He is friend, mentor and father to two strapping young sons. Older son Nate is a rising star in pop music www.sleepinglionmusic.com and Ray is a star-gazer in college studying astrophysics. He gets along well with his ex-wife and they are proud of their amicable friendship. He visits his parents in Colorado often. Jonathan is in a fabulous relationship and is as excited to see where that goes as anyone could imagine. Any more information on that front here could sound like bragging and my sweetheart would prefer to remain anonymous for now. He has been sailing since he was only eight-year old. The Long Island Sound is a great place to race and cruise with its strong winds and exciting chop. 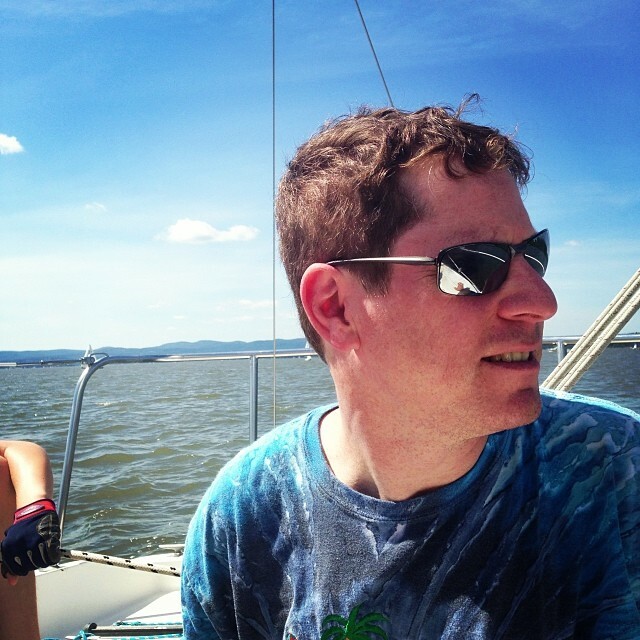 Jonathan also does a lot of pleasure sailing on the Majestic Hudson River which is closer to where he lives. SCUBA diving is his absolute favorite thing to do on vacation. Floating and drifting underwater at a super slow, space-walk-like speed allows him to observe all kinds of critters in action and he finds it so completely relaxing. He believes that we can change the world one person at a time. If you consider yourself a planet changer or you just want greater peace and fulfillment, talk to Jonathan. He is in a life-long education to identify and remove limiting blind spots to find ways to achieve magnificent, dream-come-true goals. Ask his friends. He loves his friends. He loves cats and dogs, too. Physical fitness is important to him. He enjoys trail riding on his bicycle at least five times a week. He holds his own in golf and tennis, and if you invite him to play, he’ll say, “yes”. He is better at ultimate frisbee, which he plays with bunch of geezers like him who run, catch and throw pretty well. He has been playing the piano since he was 6 years old and has been playing in bands since he was 13. He is now in a band called Kick Start Charlie www.kickstartcharlie.com with a super tight rhythm section and a 3-piece horn section, they pretty much keep people dancing and celebrating all night. If you know what those mean, you know a LOT about Jonathan. If you don’t, please ask. That means he give 100%, takes a short break and makes that extra effort to ensure satisfaction. You can count on it. Thanks for reading this far. We would be honored and excited to get to know you, too.